Actual Horn in the Chevy HD-See Video. Of course this video does not do justice to just how loud this 140db horn really is!! This Horn will get the attention of anyone in the area. This Air System can be mounted in any position. The Viair 2.5 Gallon Air System easily can mount in car's trunk..
..the bed of a pickup or UTV..
..or even storage hold of RV. Can also be mounted under vehicle as well. This Air System is considered a underbody kit. This Viair Air System can also be used for fast tire inflate, air lockers, air springs, air tools, etc. The horn is compact enough to fit almost anywhere. We give you options for compressor upgrades. Solenoid(Electric Air Valve): Included (12v/24v). *Mirror Finish-Trumpets will look like new for years to come. *Works on any 12v or 24v system. *Super Loud-Great Bang for the Buck!! *Can fit these trumpets in tight areas like behind a bumper. *Over-sized Hi-Flow Air Solenoid . 150psi (33% Duty @ 100psi). Stainless Steel valves and Bearing. Min./ Max. Ambient Temp: -40F. / +158 F.
Includes 1/4'' Stainless Steel braided feeder line. Nickel Plated Inline Check Valve. Compressor Dimensions: 8.96'' L. x 3.94'' W. x 6.77'' H.
Air Tank Dimension: 23.5"L. x 6.0"W. x 7.5"H.
0 to 105 PSI -----1 Min. 22 Sec. 0 to 145 PSI -----2 Min. 20 Sec. 85 to 105 PSI----0 Min. 17 Sec. 110 to 145 PSI-----0 Min. 48 Sec. Need a LARGER, more Heavy Duty Compressor?? We have Compressor Upgrade Options-See Menu. This Super Loud Dual Trumpet Truck Air Horn will get you noticed and will wake up inattentive drivers that share the road with you. This popular Truck horn will work in cars, RV, SUV and of course make for a great pickup truck air horn. The dual trumpet design makes is easy for mounting. Some popular spots for mounting this horn are behind front bumper or between radiator and grill. Do not be steered wrong by the inexpensive cost of this horn kit. The cost is cheap, but not the quality. This air horn has zinc trumpets that will not rust. The diaphragm housing is made of cast aluminum and is powder coated black. This Viair heavy duty on board air system produces a whopping 150psi. The Viair 400c compressor is 33% Duty at 100psi. The 2.5 Gallon Tank is an air advantage when using this air system. Simply put, it will have more volume air in reserve. 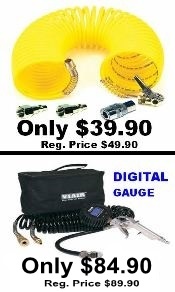 This Viair Kit is perfect for air supply for this horn, air spring kits ,air lockers, inflating tires and even air tools. The kit includes the Viair patented air filter relocation kit. This way the 400c air compressor can be mounted under the vehicle and filter can be in a location that is clean. Ideal places for the air filter is in engine compartment or inside the vehicle cabin under a seat or under a bed rail is also ideal. This will extend the life of the compressor greatly. The Viair 110psi ON and 150psi OFF pressure switch / relay combo makes wiring a breeze. This kit includes all the necessary fitting for install. Purchase with confidence, we are an Authorized VIAIR DEALER. You can use OE Horn Switch (steering wheel) to activate solenoid. You don't want to use your OE Horn Switch?? Choose option to include Horn Button Switch. Do you want to Look and Feel like a Big Trucker??? A lot of installers prefer installing an air gauge for the on board air system. 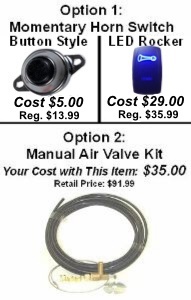 Add this gauge and save some money off buying separately. This wiring kit includes gauge, on/off switch, 20 feet of 16g wire, 20 amp inline fuse, electrical connectors & zip ties. 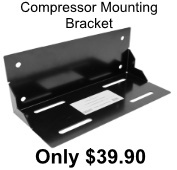 This bracket will make mounting your compressor a little easier. You can weld or bolt this bracket to vehicles frame, then simple bolt the compressor to this bracket. This will save the installer a lot of install time.